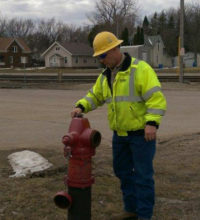 The Owatonna Public Utilities will be performing annual water main flushing beginning Monday, April 22, 2019. The following are boundary descriptions of the areas and dates the flushing will occur. Click here or on the button to the right for an interactive map of the flushing areas and hydrant locations. Just type your address into the address search bar in the upper left hand corner to see which day your area will be flushed. Flushing will occur between the hours of 7:00 a.m. and 3:00 p.m. except Tuesday, April 30, 2019 when flushing will begin at 4:00 a.m.
Monday, April 22, 2019: The area to be flushed is bounded by the City Limits on the north and east, Maple Creek & Cherry Street on the south and St. Paul Road and 3rd Ave. on the west. Tuesday, April 23, 2019: The area to be flushed is bounded by the Maple Creek & Cherry St. on the north, City Limits on the east, Havana Road on the south and Grove Ave. on the west. Wednesday, April 24, 2019 – The area to be flushed is bounded by Havana Road on the north, City Limits on the east and south, and Austin Road on the west. Thursday, April 25, 2019 – The area to be flushed is bounded by McKinley St. on the north, Austin Road on the east, city limits on the south and the Union Pacific railroad on the west. Tuesday, April 30, 2019 – The area to be flushed is bounded by the city limits on the north, 3rd Ave. NE, St. Paul Road & Lincoln Ave. on the east, McKinley St. on the south, and the Union Pacific railroad on the west. Wednesday, May 1, 2019 – The area to be flushed is bounded by 26th St. NW on the north, Union Pacific railroad on the east, city limits on the south and Interstate 35 on the west. Thursday, May 2, 2019 – The area to be flushed is bounded by Interstate 35 on the east, city limits on the south, west and north. This area will include the Industrial Park, Owatonna Airport and Cabela’s area. Customers located near the flushing area boundaries may be flushed more than once. These customers should note the days the areas adjacent to them will be flushed. When your area is to be flushed, check your water before using it to ensure it is clean.